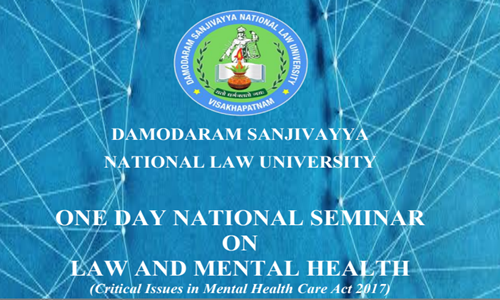 Damodaram Sanjivayya National Law University (DSNLU) is organizing a one-day national seminar on Law and Mental Health (Critical Issues in Mental Health Care Act 2017). Venue: Moot Court Hall, DSNLU, Nyayaprastha, Sabbavaram, Visakhapatnam. Promotion of Mental Health and Prevention of Mental Disorders under the Mental Health Care Act 2017. Legal issues relating to Treatment. Mental Health Laws and Rights. Legal Issues, rights for mental Health in Juvenile Justice. Legal Protection from Cruel, Inhuman and Degrading Treatment. Emerging Trends in Mental Health. Conventions on the rights of persons with mental disability. Psychology of the child victims of sexual offences and abuse.